candidates can apply for Forester jobs through online Official website of TNFUSRC is www.forests.tn.gov.in. TN Forest Dept Forest Guard jobs online application forms will available from 15-10-2018 onwards. The last date for submitting the application form through online mode is 05-11-2018. The educational qualification for the Forester, Forest Guard posts is candidates should have passed in 10th/Any Degree. 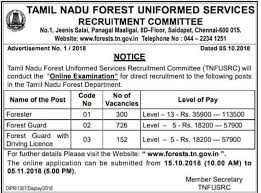 For the other details of age limit, salary, selection process, application fee and how to apply are given below for the Forester, Driver, Forest Guard Jobs in Tamil Nadu Forest Department Recruitment Notification 2018. There are totally 1178 available vacancies for the forester and Forest Guard Posts in TNFUSRC Recruitment of TN Forest Department. The age limit for the Forester, Forest Guard Jobs is in between 21 – 30 years. For Forester Jobs Candidates should have done Bachelor’s Degree in Science or Engineering with the fallowing subjects Marine Biology, Mathematics, Physics, Statistics, Agriculture, Animal Husbandry, Botany, Chemistry, Environmental Science, Forestry, Geology, Horticulture, Veterinary Science, Wildlife Biology, Zoology, Computer Applications / Computer Science, Engineering (All Engineering subjects including Agricultural Engineering). For Forest Guard Jobs should passed in 10th. For Forest Guard with Driving License is having Valid Driving License. Pay Scale for Forest Guard, Driver Jobs Recruitment in TN Forest Department. For Forester jobs salary is Rs.35900 – 113500/- (Level - 13). For Forest Guard jobs salary is Rs.18200 – 57900/- (Level - 5). For Forest Guard with Driving License jobs salary is Rs.18200 – 57900/- (Level - 5). The candidates will be selected on the basis of merit in online written examination. Interested candidates can apply for the TNFUSRC Forester, Forest Guard Jobs through online official website is www.forests.tn.gov.in. The online applications will start from 15-10-2018 onwards. The last date for submitting the application through online is 05-11-2018. Candidates fill the application form with necessary information and submit the form along with the relevant documents. For more information candidates will check in the official notification.